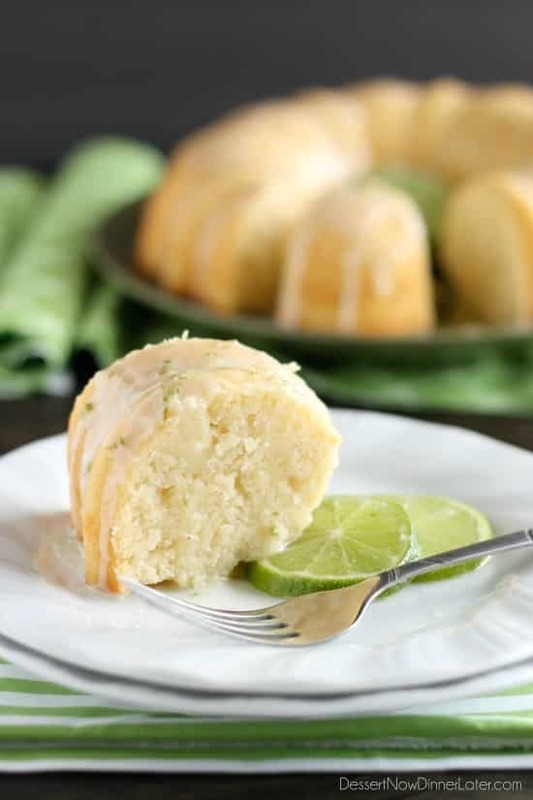 Lime Bundt Cake - Dessert Now, Dinner Later! 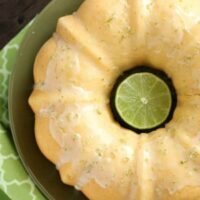 This Lime Bundt Cake is easy to whip up and tastes like pound cake with a tangy lime glaze on top! 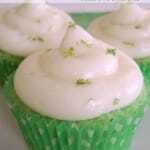 St. Patrick’s Day is next month and I celebrate every year with lime recipes. Not because they are Irish, but because they are “green.” Haha. That, and I can’t get enough citrus desserts in the late winter/early spring months because it helps brighten up those gloomy days! My son especially loved this cake because, “I can pick it up and eat it with my hands, and the frosting on top is really good!” So there you have it! Haha. 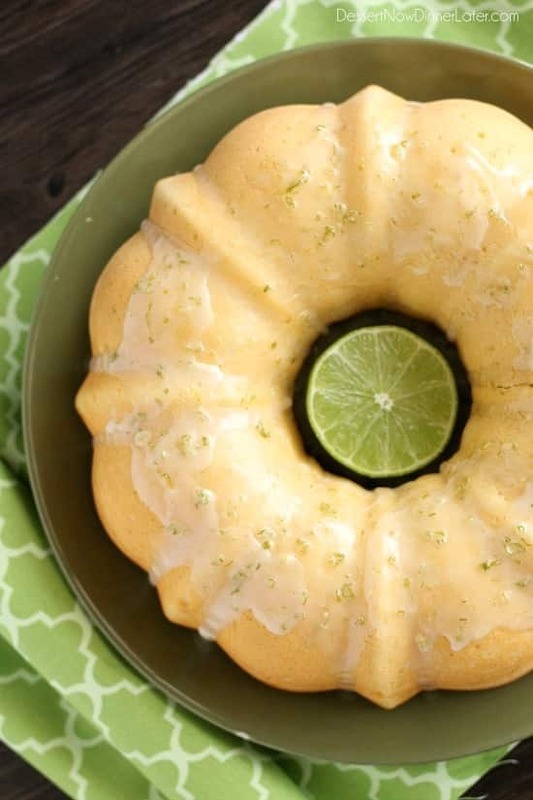 I thought the texture of this lime bundt cake was very similar to that of a pound cake, and the glaze on top is a MUST! It gives it that added ZING of bright cheery lime! I am one who doesn’t love a bunch of frosting, so this was the perfect dessert for me to have the tender cake with just enough tangy-sweet glaze to hit that sweet spot after dinner time! Preheat oven to 350 degrees Fahrenheit. Butter and flour a large bundt pan. Sift flour, baking powder, and salt into medium bowl. Set aside. Using an electric mixer, cream together butter, coconut oil, and sugar. Add eggs one at a time, mixing well with each addition. Mix in lime juice and zest until just incorporated. Pour batter into prepared bundt pan. Spread evenly with a spatula. Bake at 350 degrees Fahrenheit until a toothpick inserted into the thickest part of the cake comes out clean, about 45 to 55 minutes. Cool cake in pan for 10 minutes. Turn cake out onto a plate and cool completely. Make the glaze by whisking the ingredients together to desired consistency, adding more lime juice to thin, or more powdered sugar to thicken. Pour over cooled cake. Slice and serve. Store cake in an air tight container up to 5 days. **Original recipe was an altered version from Give Recipe if you want to see the difference of ingredients. I always think of lime and St. Patrick’s Day belonging together too because of the color hehe. This bundt cake looks amazing and perfect for brightening up a gloomy day like today. The sweet and tangy glaze sounds perfect! Thanks Kelly! Citrus flavors can definitely cheer up that winter rut right now! 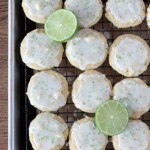 I absolutely adore lime so keep those recipes coming! This is such a gorgeous cake and I’m swooning over how amazing that glaze looks! Oh I will! Thanks Sarah! This is the most perfect bundt cake I’ve ever seen! And the lime flavor is absolutely mouth watering. Looks amazing and I love that overhead shot with the lime! 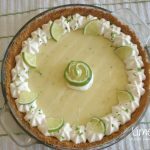 I always default to mint chocolate for St. Patrick’s Day, but lime sounds just as good! I love the quote from your son too, how adorable! I hope everyone loved it! Could I do this with lemon instead? (That’s what I happen to have on hand) Thanks! I’m so disappointed. I just made this, and it’s awful! I can’t imagine what went wrong, but it didn’t rise, tastes stale, and the consistency is like old paste or something. I could cry. Planned on taking it to ladies luncheon tomorrow. I’m glad I was suspicious that something was wrong, and tasted it tonight! Is there by any chance a misprint in the recipe? All I know to do is go buy all new fresh ingredients (flour, baking powder, oil, etc), even though none of mine were old to begin with, and try all over again. I was so looking forward to this light citrus-y beauty! Help? Dawn, I’m so sorry to hear that! What a bummer! Try swapping baking soda for baking powder, and maybe increase it to 2 tsp (instead of 1 1/2). If you want more citrus flavor, try swapping some of the milk for lime juice. I would also consider increasing the salt to 1 tsp just to help bring out the flavor of the lime more. Gosh, I’m sorry you had a bad experience. I hope these alterations help! Actually I had the same experience as Dawn. The taste is fantastic but the cake was heavy (did not rise much) and was more grainy feeling in the mouth. Will probably try it again but definitely will increase the baking powder..
Darn it! I’m sorry Nick! I might have to try re-working this recipe. I don’t super love baking powder. Maybe try baking soda and increase it to 2 tsp. Let me know if you try it again. I think the milk is the issue here, there is a lot of liquid in this cake. It night be making it playdoh-ey. Mine didn’t bake well either. I’ve totally made over this recipe and will be updating it soon! I’m making this today, but I’ve re-read the recipe several times and am missing what liquid goes into the glaze. I have the zest and the powdered sugar ready to go. Sorry about that! Thanks for the heads up! I really like the cake. 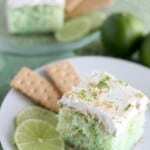 Great recipe (in its latest version), juicy and really with lime flavour. I’m glad to hear that! Thanks Katarina! Do you think this will freeze ok? I haven’t tried it, but if you do, I would double wrap it and possibly put it in a freezer bag as well. So glad I found your recipe. I made the original recipe from Give Recipe today and while the flavor was good, it was awfully dense and didn’t rise at all like a cake should. I reread that recipe several time thinking the amount of olive oil had to be wrong, and now so wish I had gone with my instinct. I will try your reworked recipe next!! I hope you find the adjustments to your liking!